The Modern Gal and I have recently moved into the 4th and Gill neighborhood. It's a sweet little area, and the people nearby are really nice and friendly. But, on the 5th, I mustered up the motivation to go out and mow the lawn when a friend of mine told me I could not mow on a Sunday. This seemed hard to believe, but when I perked up my ears, I didn't hear the faintest sound of nearby neighbors doing yard work. Considering my conservative upbringing, I kind of like the idea of reserving one day of peace and quiet for you and your neighbors, but I'm skeptical of this unwritten rule. Or is it written? Would any of you homeowners care to fill me in on the big, wide world of yard maintenance? That's new to me. We are in the Bible belt, but I've never heard that one. considering i'm the only native wigshopper, i can absolutely verify that you violated the "no mowing on sunday" rule. in fact, you don't do much of anything that involves loud noises on a sunday. no working on your muffler, no hammering on anvils, etc. growing up in east tennessee we always got our yard work done on saturday. sunday is a day of rest whether you are a Christian or not. (myself being the former). though they wouldn't admit to it, neighbors don't like it when you do yard work on sundays. they want to watch the final round of wimbledon or the masters or that "movies for guys who like movies" marathon on TBS or wherever. i must note that gardening is OK. as long as you aren't roto-tilling or using a gas powered auger. flower beds are acceptable as well. 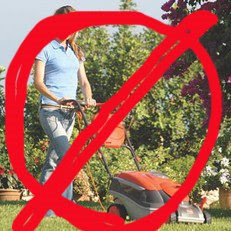 I'm also a native (relatively) Wigshopian, and I have just plain never heard of any injunction against mowing on Sunday. There may be an injunction against mowing the day after a holiday that involves sitting outside and drinking all day. Maybe that's why no one was working on their yard n the 5th? I'm sure if anything this is one of those unwritten "rules" or perhaps there was something like it once written into the archaic blue laws. But no one's going to bust you or I for it. I'm sure our neighbors will just be glad we mowed and probably won't care that we've done it on Sunday, as long as we're not doing it at midnight. Unless it is codified policy, tell them to cram it with walnuts. I've always known it was an unspoken creed throughout the bible belt, but never gave much mind to it. Besides, if it truly bothered someone, I would simply point out the sabbath is on saturday and blow their minds. I'm just gonna leave this one alone. I have lived in 4th & Gill for the past 8 years and have loved (almost) every second of it! I mow whenever I find the time - whether that be a Tuesday afternoon or (gasp!) a Sunday morning. I think you'll find that 4th & Gill, much like Old North and Downtown is a little less "bible-belty" than the rest of Knoxville. It's not that many people aren't religious - they're just less in-your-face about it. We're just happy to have great neighbors like you that are willing to put in the work an old house often requires! Welcome to the neighborhood! my wife and i have lived in 4th and gill a year now and not only have i mowed my lawn on a Sunday afternoon or evening, so have my friendly neighbors. i agree with Discordia, tell them you're a seventh day adventist. Last time I checked, 4th and Gill was still located in America...so mow whenever ya want. If you get any static, just tell the neighbors that you're a wiccan - that should keep them from bothering you. Voodoo. Works everytime. They'll beg for you to mow on Sunday after you bury livestock in your yard a couple of times. Mowing on Sunday is verboten in the more conservative parts of the South. Sunday is for church. And it's not unwritten or unspoken, because a neighbor greeted my mother when we moved to East Tennesseee, "Welcome to the neighborhood! Now, right off the bat, I have to tell you that if you try to mow your yard on Sunday, Mrs. E will come out here and glare at you until you stop. Mama never tested that theory. Mrs. E was scary. You guys need to install a moss lawn. No mowing required. Even on Sunday. moss would be so soft. Yep, no Sunday mowing in the Bible belt. That's when these folks go to restaurants after services so that other people have to work for them. And then instead of tipping they like to leave little cards telling you that instead of a tip, they're giving you a little card telling you that jesus loves you and that matters more than being able to pay your rent on time. And it's always the old people who do it. My middle finger wouldn't give a crap about Mrs E's glare. i think its just the right thing to do. leave sunday to relaxing without power tools. there is enough noise as it is in the world. And on the eighth day, God made B.
I dunno... I'll mow your lawn for $100. Huh. Never heard of this rule. And Sunday is normally my mowing day. ::shrug:: If someone doesn't want me mowing on Sunday they can come mow my yard for me some other day. I don't know. I always mow whenever I feel like it, which is rare. I guess I just never paid attention to what day it is! I live in Old North and I don't believe we have any stipulations against mowing on Sundays. Sundays in my neighborhood tend to be reserved for ice cream truck songs that sound a little off-key, porch building, polka music blaring from my neighbor's Thunderbird, and most of my neighbors passing out drunk in their yards. I grew up in Knoxville, in the fourth and gill area for that matter, and I've never heard of no mowing on Sunday. Sounds a little nutty to me. And as busy as I am, if I had a yard I would darn mow it when I could Sunday or not. Luckily I am currently an apartment dweller. Where you and the Modern Girl trying to paint chip my house on Gratz earlier this week? As for maintaining in the 'hood- we borrow and loan a lot of tools to make it all happen. Hit us up anytime.